SARAH DAVIDSON’s practice investigates the appeal of the weak, delicate, and otherwise diminutive, by placing it in playful parallel to other ostensibly unrelated ideas. With its delicate construction reflecting a delicately humorous attitude, her current body of work poises at the intersection of art history and embodied experience of space. An ongoing interest in the fragment as symbol reflects an interest in medium as gendered and maps as they exist in lived time. Past fragmentary explorations have aligned historical craft—particularly the stitching of quilts—with depictions of landscape as background. 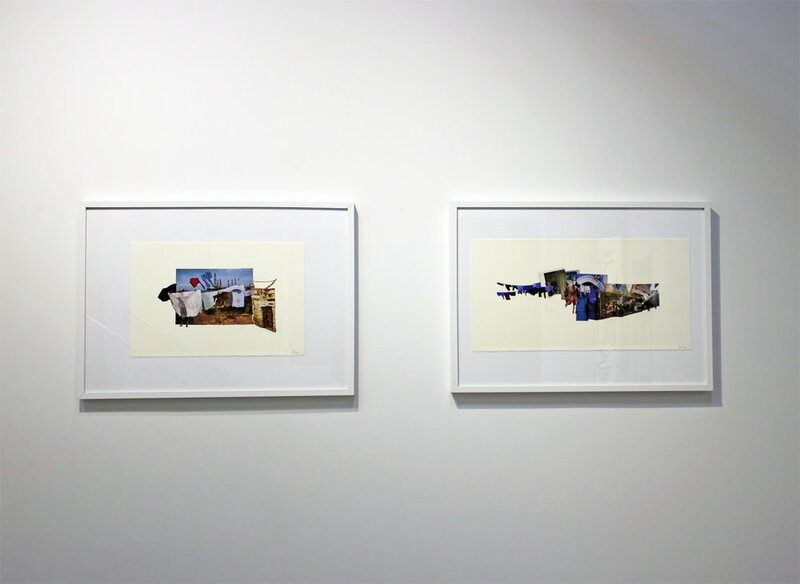 Her more recent work treats the fragment itself as symbol, character and vocabulary. Davisdon graduated from Carleton University in 2011 with a journalism degree (HBJ, Journalism and English), before attending Emily Carr University of Art and Design and graduating in 2015 (BFA, Visual Art). 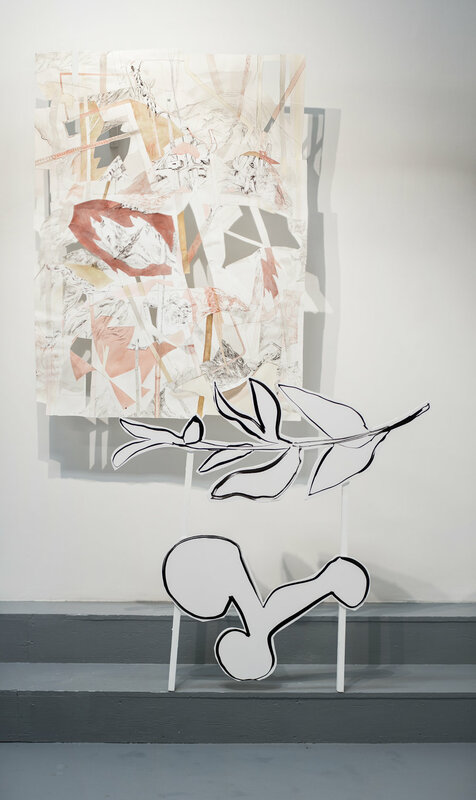 She has exhibited her works in solo shows 'Backgrounds' at Chernoff Fine Art in 2015, and more recently in ‘the scrap collector’ at Gam Gallery in September, 2016. 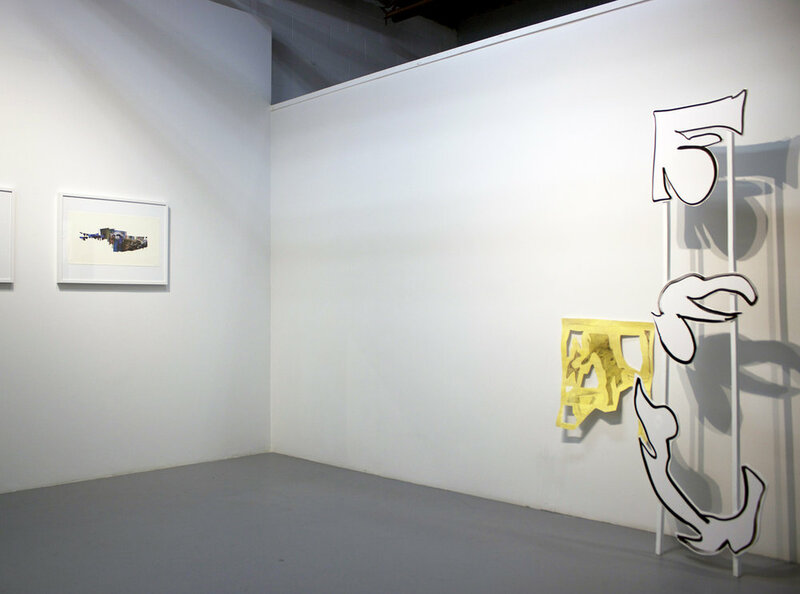 Recent group exhibitions have included ‘Puddle Popper’ at Dynamo Arts Association, part of an ongoing collaboration with Sonja Ratkay, Juli Majer and Melanie Thibodeau, which continued as a publishing project and installation at the Vancouver Art/Book Fair and will have its next iteration at Calgary’s New Gallery in November 2017. Davidson recently took part in AiR Sandnes residency in Norway, where much of the work for ‘in line, to glue’ was created. 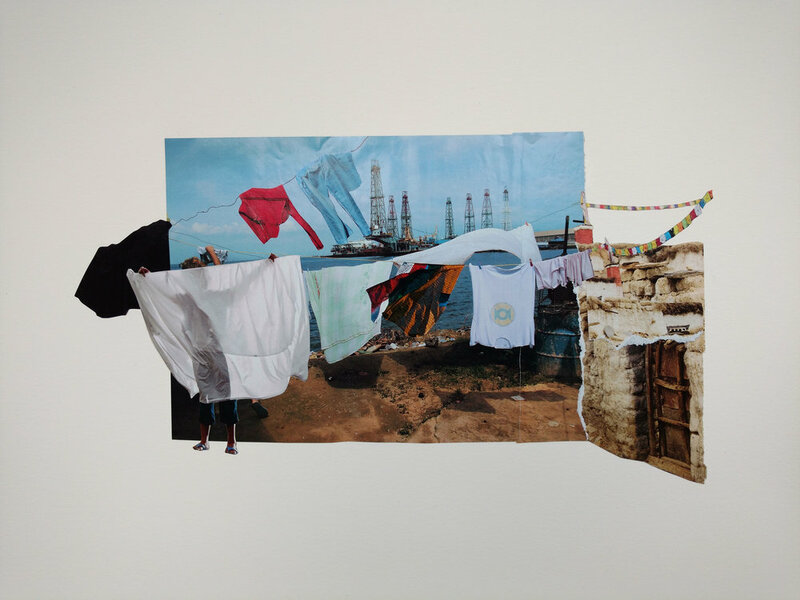 ELISABETH HORAN'S current body of work focuses on splicing together found images of clotheslines. Horan appreciates the characteristics of this particular subject matter in that it can simultaneously represent lightness and heaviness. In previous collage works she used ink shadows to suggest a moving source of light (the sun) and chairs to speak directly to the act of sitting, waiting, meditating and reflecting. The clothesline has a relatable and universal visual presence that can trigger distinct memories. A romanticized notion of simpler times. Horan finds something inherently ethereal and dreamy about clotheslines. In her studio practice she searches through magazines for source material. For Horan, printed matter represents a sort of souvenir of our collective subconscious. The combination of this artistic process and the particular imagery chosen brings psychological potency to this body of work. Elisabeth Horan is an artist living and working in Portland, Oregon. Horan attended the University of South Florida in Tampa where she earned her BFA in sculpture. In 2014 she received the Career Opportunity Grant from the Oregon Arts Commission to support travel to Finland for a residency at Arteles Creative Center. In February 2017 the artist will attend a ten-day residency at Space Gallery in Portland, Maine, where she will complete a large storefront sculpture installation.